to New York City! I'm going to refrain from sappy reminiscing, because right now I am just way too excited. Of course I'll miss all the people and places I love in the great south, but that's what airplanes are for. Got this fur coat from LuLu's the other day, just in time for the chilly east coast weather. Have a fabulous time in NYC!!! I can't wait to see all the fun things you do while you're there :) And I hope your move is smooth sailing. have an amazing time!!!!!!!!!!!!!! !living in NYC is definately a dream for the most of us so enjoy it as much as you can and please please let us know of your experiences!!! i really like this type of bags.definately red is a nice colous but if i could have one it would definately be in neon colours! !love your sweater too! !the bow tie is so so so cute!!! You look awesome, love the fur coat! Love the sweater!So cool you are living in NY now! i love your bag sooo much!!! 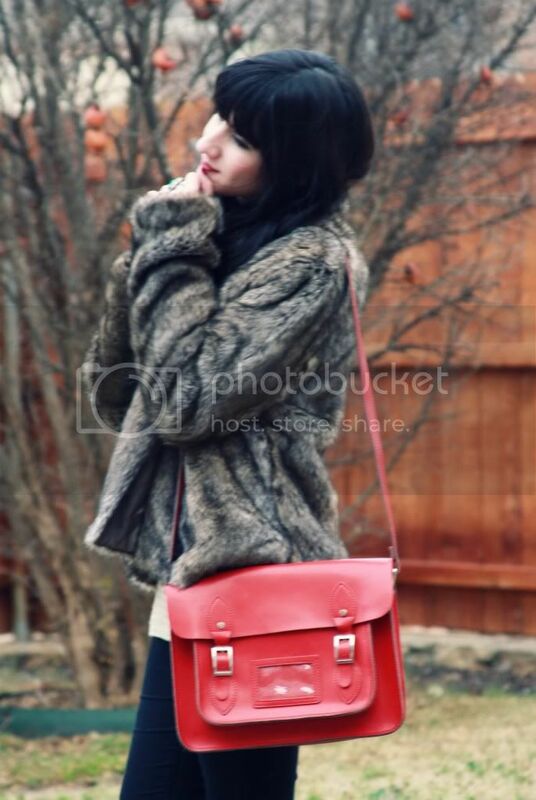 The coat looks so warm, and I love your bag!! Its amazing! LOVE the outfit, that coat looks so comfy! That coat is so furry! I love that purse, the red is perfect! Good luck with the move :) I love your bag and coat! congratulations dear, good luck in this new adventure! You look so glam. Gorgeous as always! love your coat , so great and warm! I cant believe your heels are from forever21! So cute!!! ps take me to ny with you! I simply adore your platform! 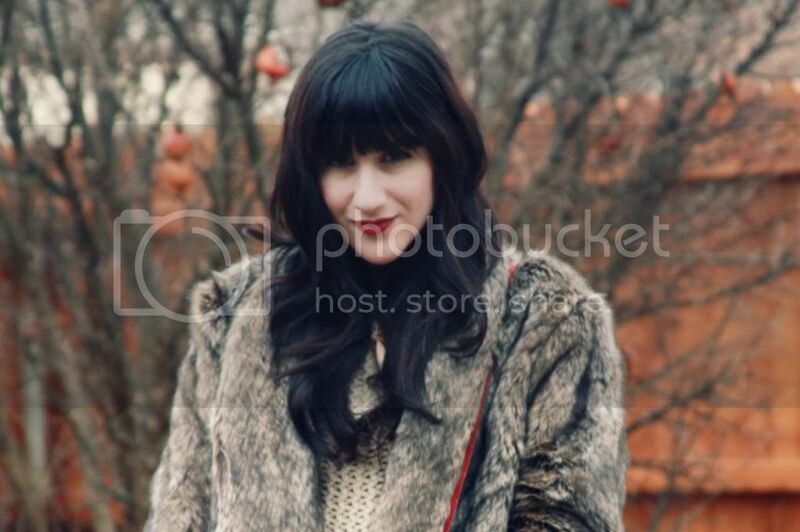 love your fur coat and I'm totally jealous of you for moving to NY :)! I hope your moving goes well! Loving the fur, I just got my first 'fur' item recently, they feel so glamorous. As I said on Instagram, have a safe flight! Such a sweetheart! Have a nice trip! 1. I want that everything you're wearing, it's beautiful. 2. Your new fringe/bangs suit you so much. 3. You make me want dark hair again! That satchel is stunning. Good luck in New York. Love this outfit, and the shoe in particular, gorgeous! OMG!!!!!! Soooo jealous, it's my fave city in the whole wide world. Good luck with the move Bonnie & I'll look forward to reading your blog even more now!!!! gorgeous!! <3 good luck for nyc, cant wait for your posts from there! you look gorge, the jumper, coat, everything. That knit top with the bow is so lovely. And your jeans are a perfect shade of denim too. 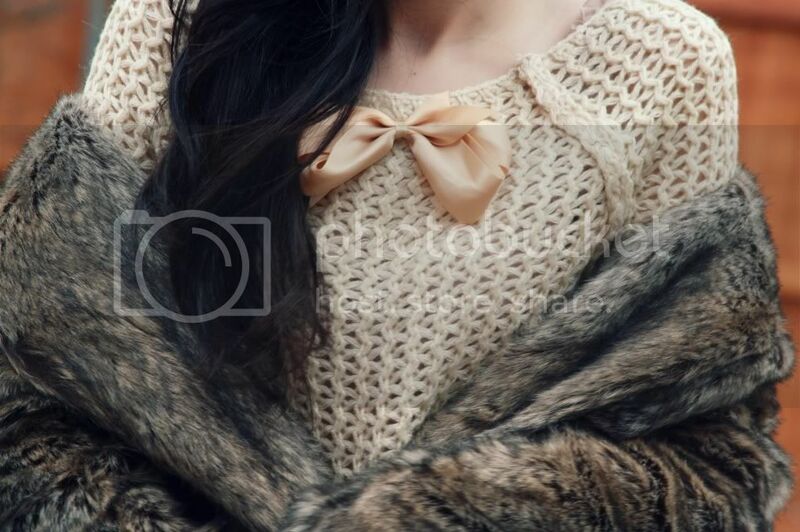 Such a cute sweater, love the bow! Super cute! I'm wearing a bow-tie today so we're kind of on the same wave length. I'll be posting pictures up next week! Have a great weekend! That's so exciting, now I'll just have my fingers crossed that I'll see you around! That's so exciting - and NYC is such an amazing place to live! I hope the transition goes smoothly. Congrats on your move! I hope everything goes well. you look so warm haha! I don't know which one I love more - the sweater, that gorgeous ring or the cool red bag! Have an awesome time moving to NYC! Can't wait to see all the pics of the adventures you go on while living in New York! I really like your sweater with the bow its so cute. Congrats on the big move. The city is an amazing place to be with all the things happening there. have fun! i can't imagine any cooler place to move than NYC. good luck settling in. can't wait to see how you're getting on in your new digs. Congrats girl and have so much fun!!! p.s. Love your red satchel it's so eye catching. hermoso outfit1 ame el sueter y los pantalones! ;) vista mi blog! what a fabulous fur coat!!! This outfit is amazing! You fur is perfect! i like your coat and ring.now i´m following you by twitter too. Ahh I'm so happy for you! your coat is gorgeous!!!!! !aw i'm so jealous!you'll must have a great time there! Hope you had a good, safe move and are enjoying NY! 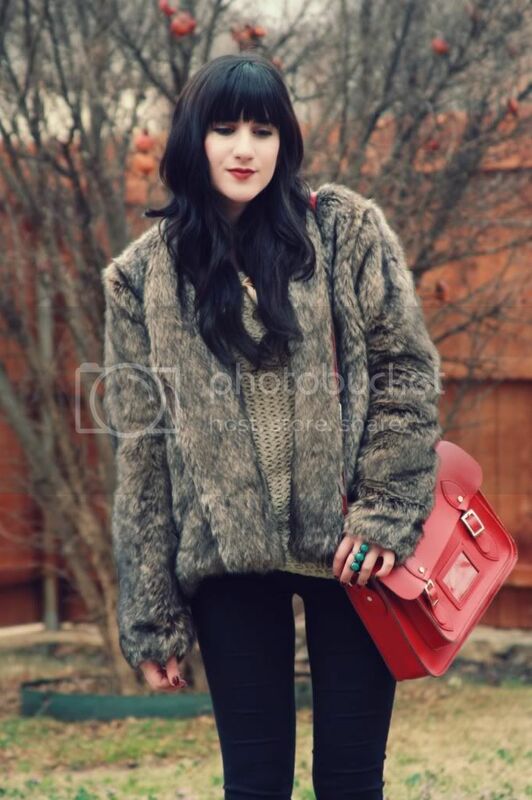 Love your red satchel - I have the exact same one! 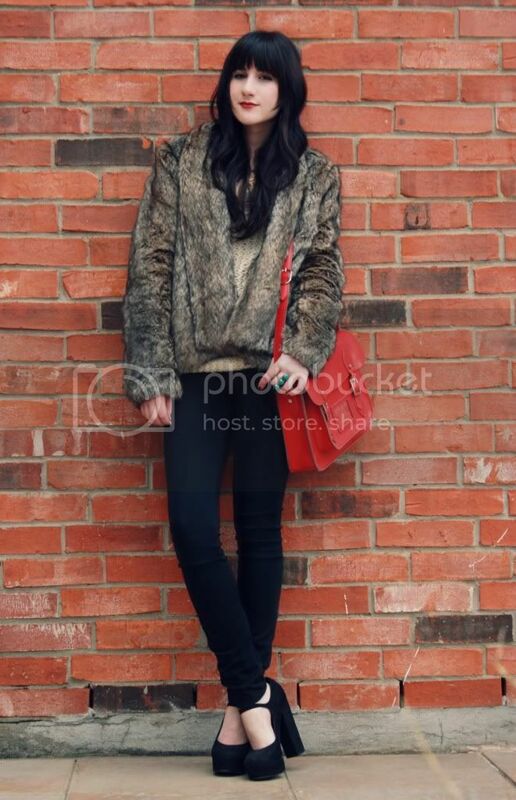 The fur, the bag, the shoes,the bow - it's so ridiculously good! wow thats a really great news! congrats and hope you like it there! love your shoes and bag btw! I love this look! I also like how you added the leather satchel! Thank you so much for visiting my blog! So chic and cozy! Absolutely impeccable! You look lovely! Especially the shoes! That's so exciting! Good luck with your move! Gorgeous outfit, love the cute bow tie! love the mottled color of the jacket, beautiful, though, i must admit, i cannot force myself to jump onto the faux-fur bandwagon. a little bit as an accent is acceptable to me, but full fledged jackets, not sure i can go there. congratulations, you will definitely enjoy nyc! Adorable sweater! I still can not resist bow detailing! You look so pretty! Have great time in NYE!! Cant believe those gorgeous shoes are F21. Nice.